In the 1841 census, he gave his birth county as Lincolnshire. The nearest match is in the village of North Kelsey, 26 miles SE. William, son of John Dent and Sarah Gaskin, was baptised on on 19 Oct 1760. He was the eldest son of a yeoman farmer. There is a burial for William Dent on 25 Aug 1767, but no relationship is given, so this is probably not John and Sarah’s 7-year-old son. There is, however, a baptism in 1789 for a son of William and Ann Dent. This, together with the considerable distance between Broughton and North Kelsey, means that this identification can be only conjecture. A rather younger possibility is the baptism of William, son of David and Hannah Dent, on 1 Sep 1762 in Bishop Norton, some 6 miles south of Broughton. Ages given at death are not always accurate. Here, there are two burials for William Dent before the date of William and Elizabeth’s marriage. There is no evidence of this William Dent raising a family in Bishop Norton. Whatever his birthplace, he was settled in Broughton by the time of his marriage in 1783. Like most of the other Broughton Dents at this period, he became an agricultural labourer. In 1781 a bastardy bond was made for the male child of Mary Dent in Broughton by Brigg parish. The father was not named. The bondsmen were William & John Tomlinson. probably means that one of the Tomlinsons was the father. We do not know how Mary Dent was related to William. We know of no other Dents of his generation in Broughton, so it seems quite likely that she was his sister. ELIZABETH HOYROY . The age given at her death indicates that she was born in 1759/60. This makes her the daughter of Joseph Hoyroy and Mary Parkinson, baptised in Broughton on 29 Oct 1759. Her father was a warren-keeper. Elizabeth was the oldest of three girls. When she was 11, her mother died. The following year her father remarried. At least four more children were born. William Dent and Elizabeth Hoyroy were married in Broughton, Lincs, on 14 Mar 1783. They had five children baptised there. This was a bad time to be a farm labourer. Low wages and rising food prices meant that across the country there were angry, sometimes violent, protests. The Lincolnshire countryside, far from being a place of peace, stability, and communal harmony, was characterized by violence, discord, and class antagonism. Severe weather in 1794-5 reduced Lincolnshire’s wheat crop by a quarter of its normal size. The cost of the labourer’s diet rose by 37%. A good day’s wage twenty years ago became a starving one now. Acute food shortages during the Napoleonic wars exacerbated the problem. A new wave of rioting broke out in 1800, as the prices of meat, cheese and bread soared to new heights. There were few jobs available at the hiring fairs. Day labourers were said to be ‘starving for the want of employment’. The cold spring of 1828, and the heavy rains which followed, devastated crops, as did the wet, cold weather of I829 and 1830. In Brigg, the neighbouring parish to Broughton, desperate farm workers set fire to stacks, barns, and farm machinery. The authorities countered this by mobilizing Yeomanry cavalry units and establishing armed associations. A detachment of the North Wold Troop was based at Brigg. Mounted and unmounted sections were tasked with of arresting ‘all suspicious characters and persons who may be found assembled for the breach of the peace’. Large rewards were offered to informers. These armed associations were effective because they were disciplined and well organized. In 1831-2 the labourers redirected their grievances over unemployment and poor wages to the itinerant Irish. Threats were made against farmers who hired them. The Irish themselves were often assaulted. When outdoor poor relief was reduced further it led to ‘diabolical acts’. Although the revolt was largely suppressed, covert acts of violence against landed property continued into the 1840s. On 6 May 1811 William and Elizabeth’s daughter Mary married Robert Bones of the West Kent Militia at St Mary’s, Hull. When the Militia was disbanded in 1814, Robert and Mary, with their young son William, came to live in Broughton. Robert became a cordwainer (shoemaker). Many more grandchildren were born to William and Elizabeth. In the 1841 census William and Elizabeth Dent are living on their own in Broughton. Their ages (rounded down to the nearest 5) are both given as 80. No occupation is given for William, but we know from the 1851 census that Elizabeth was an agricultural labourer’s wife. William died two years after this census and may have been unwell by this time. In the 1851 census, Elizabeth was a pauper. It may well be that both of them were in 1841 too. In 1811, 125 out of 169 families in Broughton were employed in agriculture. The proportion receiving poor relief was small. It peaked in 1803 at 15% In some southern counties it was as high as 40%. The largest group receiving relief were the over-60s. Some were given weekly pensions, typically 3s in the 1830s. These had the advantage of being regular payments, unlike the fluctuations of farm work. Casual relief could be in cash or kind, including clothing and fuel in the form of furze or coal. Other sources of income available to the poor were poaching the numerous rabbit warrens in Broughton’s sandy soil. The diary of Abraham de la Pryme, vicar of Broughton in the late 17th century, told how people picked lily flowers in the woods to sell. This was still occurring as late as 1869, according to the Victorian editor of the diaries. The poor law in Broughton remained more of a safety net of last resort than an all-encompassing welfare system. Broughton has extensive records of the Overseers of the Poor and vestry meetings. A search of the local archives would probably tell us more about the Dents’ receipt of poor relief. In the early censuses there are only a small number of Dents in Broughton. Three houses away from William and Elizabeth in 1841 are their daughter Mary, her husband Robert Bones and their three children. 3 houses further down the list is their son James, his wife Catherine and 14-year-old James Burton, whom we learn from the 1851 census is James and Catherine’s grandson. There may have been other married daughters whose names we do not know. The impression we get is of a tight-knit family. The only other Dents in Broughton in the 1841 census are the family of Frederick and Hannah Dent. Frederick is also an agricultural labourer. He is living with his wife Hannah, four children, and young agricultural labourer John Serjeant. Frederick Dent, son of the unmarried Mary Dent, was christened on 11 May 1800 in Broughton. This echoes a similar birth of a boy to a single Mary Dent in 1781. We do not know whether this was the same woman. If so, she may have been the village prostitute. Frederick’s family of Dents is living at Dicoy Place, Broughton. Broughton Decoy Farm lies immediately to the east of Brigg. “A Duck Decoy, not the wooden carved variety used by wildfowlers, was set up over a pond, waterway, section of river etc and was designed to trap ducks for food, commercial sale. 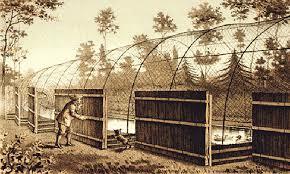 It consisted of a framework covered by netting with a gradually tapering entrance which gradually herded the ducks in for capture. The ducks were either lured in with food or driven in using a dog and in parts of Europe the same technique is still in use. Two years after the census, Willam Dent died in Broughton and was buried on 16 Oct 1843. He was 83. The widowed Elizabeth moved to live with her son James and his family. Elizabeth Dent Mother Widow 91 Pauper formerly Ag Lab wife. Frederick Dent and his growing family were now at Broughton Common. By the time Mary’s husband Robert Bones died in 1848 he had become another agricultural labourer. Agricultural labour was the norm for this family. The only one to buck the trend was Mary. When her husband Robert died in 1848 she could have fallen into poverty, like her elderly mother. Instead she reinvented herself as the village postmistress. Elizabeth Dent was buried in Broughton on 24 Jan 1854, aged 95. Sir Ralph Payne Gallwey. The Book of Duck Decoys, 1886, Chapter 8, Page 125.